Personal Mythbusting: you can do more than you think right now! I’m not just blowing smoke with this statement: I just completed a test of it myself. Result: Utter Bunk. 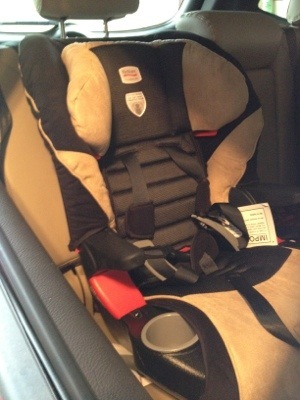 Annoyed at tripping over it and full of fire, I just went outside and installed that darn car seat, tricky buckles and latches and all. AND I tested it out with my daughter and she fits in it. I am 99% sure I did it right; regardless, I no longer have to stare at the damn thing sitting in the box a moment longer. In the current mood I am in, my husband may well come home to find that the new shower head installed and the bathtub caulked. Well, probably not. But I totally could. Test Assertion Two: Because I am so out of shape I can’t do anything. Now, I don’t mean this in absolute terms: I actually walked this morning like a good girl. But I did so hesitantly, gingerly. I’ve been putting off weights, the elliptical, etc. recently, coming up with all kinds of excuses. When I was walking the dog a little bit ago, I started getting pretty down on myself – I could actually feel my arse jiggling and the judging eyes of the local geriatric community. Result: Bumpkus! In what can only be called as sheer stupidity, and an utter shock to the pug, when I turned around at the end of the block to go home, I started jogging. I decided I was going to go all the way home, too. Now, I happen to know it’s only .30 miles from the curb to my driveway, but I would be lying if I said I believed I would manage it. Thud. Thud. Thud. I pounded down the sidewalk, feeling every extra pound and breathing carefully and one hand on my chest to check for heart attack. But I made it, dammit. I marched VERY proudly up that driveway. I’m not going to be an idiot about it, but if I can run even that far, I can certainly pick up my game quite a bit. It’s my mind, not my body, that’s talking trash. These are just two little tiny things that I challenged myself to do today. What something are you holding back on today? If I can do it, I know YOU can! Go challenge something and tell me what you did! I haven’t done anything amazing today … yet. But I do recommend C25K (that’s couch-to-5-k, not couch-25-k!) if you’re interested in a verrrry gentle way to incorporate a little light exercise into your routine. Even better if you can do it on a smartphone or iPod because then you can use an app that will tell you when to walk and when to run, removing all of the clock-watching angst (and related defeatest thinking). I did it last summer and ran a 5K in October. It is 100% doable!